(From Pentax lens literature) Ricoh Imaging Americas Corporation has announced the availability of the first model in its new generation of PENTAX Star series lenses, the HD PENTAX-D FA*50mm F1.4 SDM AW. This large-aperture, prime lens delivers stellar imaging performance and maximum light transmissionthe hallmarks of the acclaimed Star series line -- and is the perfect companion to any K-mount digital SLR camera including the full-frame PENTAX K-1 and new PENTAX K-1 Mark II models. The HD PENTAX-D FA*50mm F1.4 SDM AW lens delivers exceptional resolving power from the center to the edges of the image field, even when set to open aperture. The lens incorporates state-of-the-art PENTAX-developed lens coating technologies -- including the new Aero Bright Coating II for exceptionally low reflectance and high-grade high-definition (HD) Coating -- that enable it to produce extra-sharp, high-contrast images free of flare and ghost images. The lens's dustproof, weather-resistant body also makes it extremely dependable and durable for shooting in demanding outdoor conditions. Its PENTAX K-mount covers the image circle of a 35mm-format full-frame image sensor. The new lens is the first produced following Ricoh's extensive review of standards for the top-of-the-line Star series. Engineers evaluated a variety of approaches to minimize aberrations and deliver the highest image quality. The HD PENTAX-D FA*50mm F1.4 SDM AW lens is designed to deliver optimum imaging performance with all compatible camera bodies, including next-generation digital SLRs. This lens has been developed as a new-generation member of the high-performance Star series -- a lineup designed to deliver extra-clear, high-contrast images with edge-to-edge sharpness while keeping aberrations to a minimum. The lens, which is the result of an extensive review of traditional Star-series standards, provides greatly improved resolving power, which enables it to deliver excellent imaging performance even with more advanced, next-generation camera bodies. Developed as the first model of the new-generation Star-series lenses, the new lens boasts an extra-large F1.4 maximum aperture, useful with many different subjects in a range of applications, including portraiture with an effectively de-focused (bokeh) background, and handheld shooting of indoor scenes. It provides exceptional image quality even at open aperture, as well as outstanding performance at close ranges. The lens is treated with PENTAX-developed Aero Bright Coating II -- a lens coating developed using a state-of-the-art nanotechnology process. It consists of a silica aerogel layer with a uniform porous structure over a regular multi-coating layer that reduces surface reflections across a wide wavelength range and produces crisp, high-quality images. Developed as an AW (all weather) model, this lens features a dependable dustproof, weather-resistant body with eight special seals to prevent the intrusion of water and dust into the lens interior. When paired with a PENTAX weather-resistant digital SLR camera body, it forms a durable, reliable digital imaging system that performs superbly in demanding conditions even in rain or mist, or at locations prone to water splashes or spray. 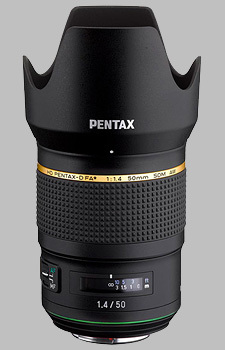 HD PENTAX-D FA* 50mm F1.4 SDM AW will be available in late July 2018 at www.ricohimaging.com and retail outlets nationwide for a manufacturer's suggested retail price of $1,199.95. The Pentax 50mm f/1.4 SDM AW HD D FA* doesn't have any user reviews yet!